Jacopo Tintoretto (c 1518-1594), The Crucifixion (detail) (E&I 123) (1565), oil on canvas, 536 x 1224 cm, Albergo, Scuola Grande di San Rocco, Venice, Italy. Wikimedia Commons. The scuole (plural of scuola) in Venice were fraternity institutions. There were numerous regular scuole, but a few rose to become officially recognised as Scuole Grandi, which had elaborate constitutions and were regulated by the Procurators of the city. In 1564, there were just six, of which the Scuola Grande di San Rocco was the second youngest, being founded in 1478. In addition to their system of boards and officers, the Scuole Grandi had grand premises. In their main building was an androne or meeting hall, and its upper floor had two rooms for smaller gatherings: the larger one was used by its main board, and a smaller albergo for its supervising committees. There was usually an affiliated hospital, and of course the Scuola’s church. The Scuole Grandi also had a long history of commissioning music and musicians, and art, including architecture, sculpture, and painting. San Rocco’s meeting house had undergone protracted and costly development, being started on its formation in 1478 and only ‘substantially’ completed seventy years later in 1549. In 1549, in a bid to strengthen his hand with the Scuola Grande, Tintoretto donated his painting of Saint Roch Cures the Plague Victims to its Church of San Rocco, but it had been his patron Tommaso Rangone who commissioned his recent series of paintings of Saint Mark. Then in 1564, the brothers of the Scuola Grande called a competition between the leading painters of Venice to start providing paintings for its albergo. Jacopo Tintoretto (c 1518-1594), St Roch in Glory (E&I 101) (1564), oil on canvas, 240 x 360 cm, Albergo, Scuola Grande di San Rocco, Venice, Italy. Wikimedia Commons. 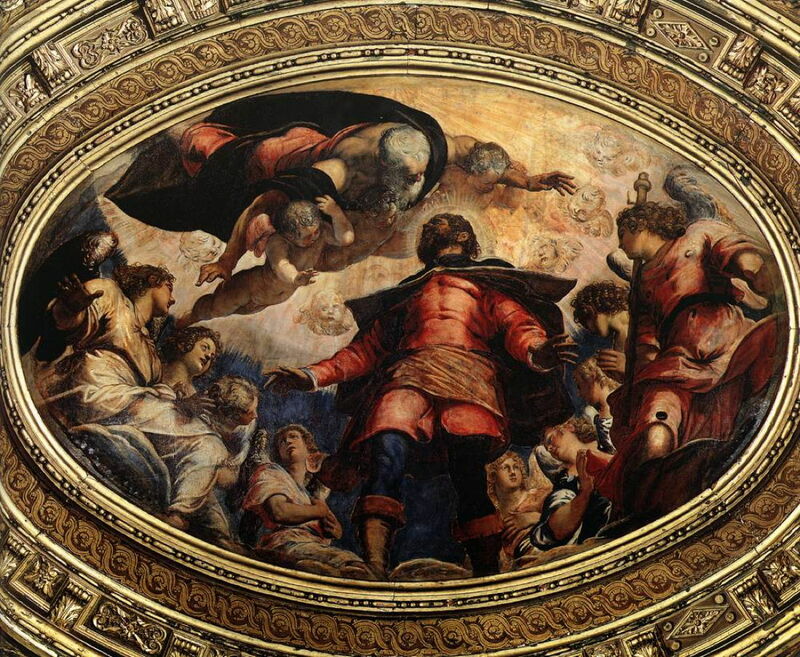 Tintoretto, faced with hostility from some of the brothers, pre-empted the competition by donating what was intended to be the thematic centre panel of the ceiling: St Roch in Glory (E&I 101) (1564). 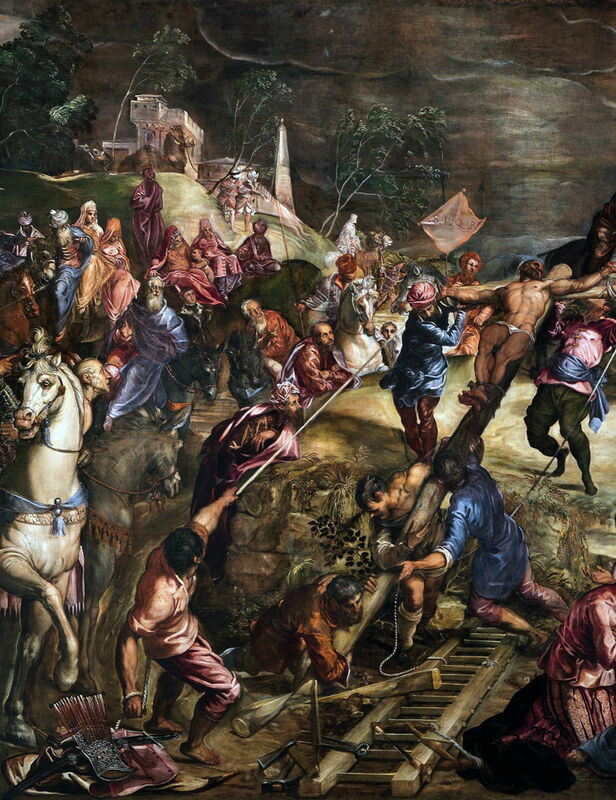 The full story is given by Tom Nichols (2015, see references below), and resulted in Tintoretto stealing the commission, and completing twenty-two more paintings to complete that project. Over the following years, his paintings came to dominate the treasures of San Rocco, and his place in the history of art was assured. Of the seventeen works provided by Tintoretto at this stage, for the albergo, this is the only one now believed to have been entirely his work. Twelve allegorical figures, four seasons, and various more decorative paintings were most probably painted by his studio. 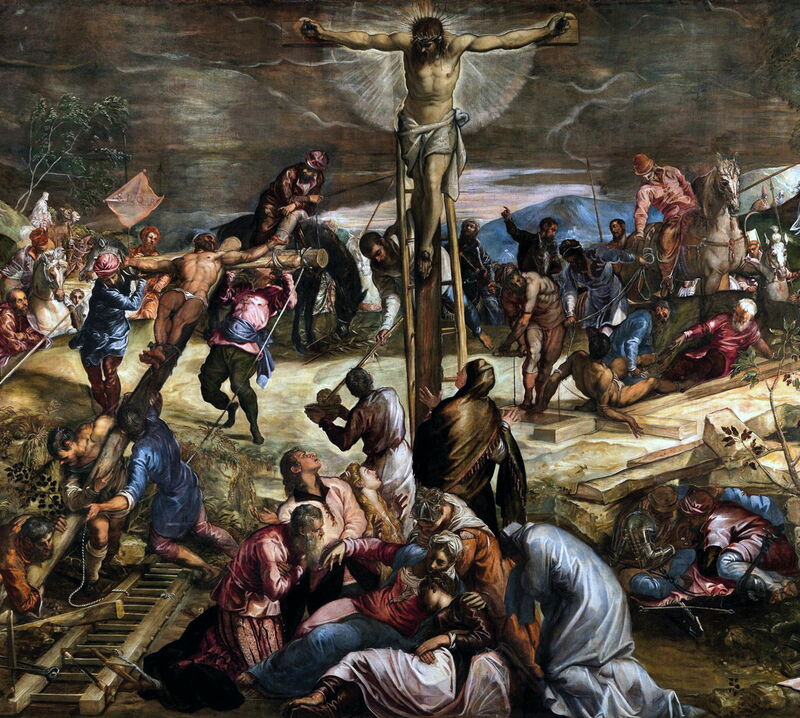 The following year, commissioned again by the Scuola Grande for its albergo, Tintoretto painted one of the major religious works of the century: his vast Crucifixion (E&I 123) (1565). This is over 5 metres (17 feet) high, and 12 metres (40 feet) across. With the experience of his previous Crucifixion of about 1558 behind him, and having at last convinced the sceptics of San Rocco that he was to be trusted, he applied the lessons learned in his tall works for the Madonna dell’Orto. He makes use of space and uses a narrative technique based on the traditional ‘multiplex’ form popular during the Renaissance, in which its single image shows events at more than a single point in time – but in an ingenious and modern manner. Naturally, the painting centres on Christ crucified, but the two thieves executed beside him are not shown, as would be traditional, already hanging from their crosses. Instead, to the right of Christ, the ‘bad’ thief is still being attached to his cross, which rests on the ground. To the left of Christ, the ‘good’ thief is just being raised to the upright position. There is nothing in the well-known gospel accounts which actually makes this view anachronistic, but it is most probable that the crucifixions were more simultaneous. It is thus an ingenious artistic device which shows the three executions at different times, and is therefore ‘multiplex’ (or ‘continuous’) narrative. But here it avoids the archaic repetition of figures or other content, as Tintoretto applies it to discrete passages within the whole. Spaced out around the canvas are relevant sub-stories from that whole. At the foot of Christ’s cross is his group of mourners, including the Marys. Each of the crosses has attendant workers, busy with the task of conducting the crucifixion, climbing ladders, hauling on lines, and fastening each victim to his cross. This mechanical and human detail brings the scene to life and adds to its credibility, and grim process. The crowd on the left is more spread out than in his earlier depiction. In the distance is a flag bearing the letters SPQR representing the Roman Empire, and its link through Pilate. Most faces are turned towards Christ, with their eyes wide in awe. On the right, in a small rock shelter suggestive of a tomb, two men are gambling with dice. To the right of them, a gravedigger has just started his work with a spade. The ruling class, perhaps Herod himself, have turned up on horseback, and they too stare wide-eyed at Christ. 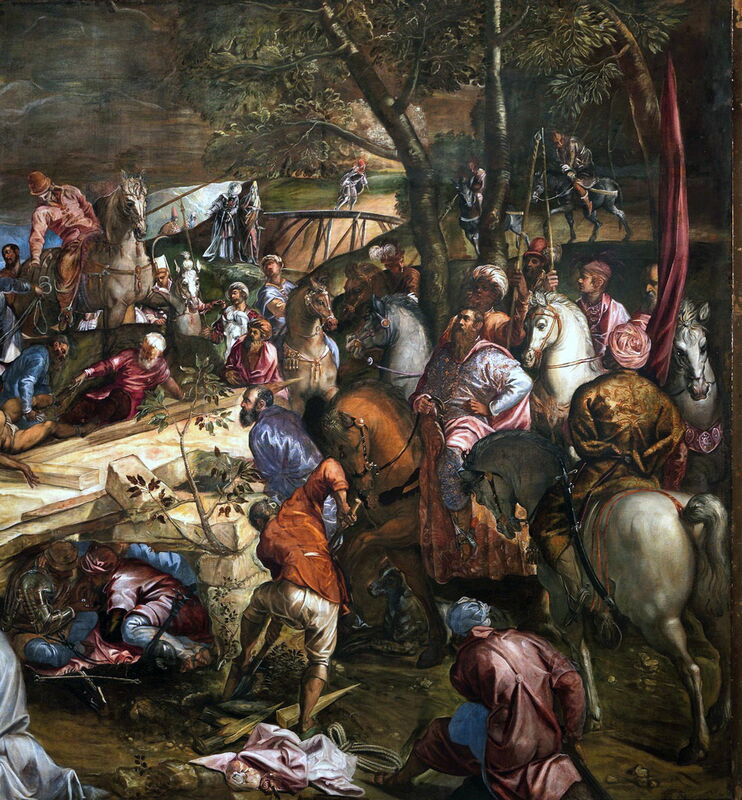 Later, to accompany this vast centrepiece, Tintoretto painted other scenes from the Passion, which I will examine in the next article in this series. Posted in General, Life, Painting and tagged history of painting, narrative, painting, Scuola Grande, Tintoretto, Venezia, Venice. Bookmark the permalink.